Application: Hexagon insert bits and Wera Series 1 and 4. Design: 1/4'' hexagon socket with Wera quick-release chuck and Rapidaptor. The Wera ESD tool series are indispensable when it comes to working with electrical appliances and integrated circuits. The electric resistance of the Wera ESD material securely protects components against electrostatic energy and associated damage. Wera ESD screwdrivers offer Wera's Black Point tips and a refined hardening process to ensure long service life of the tip, improved corrosion and an exact fit. 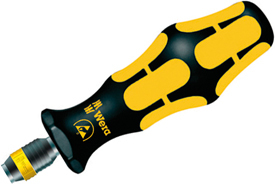 The 05051464001 Wera Kraftform 816 R ESD Non-Magnetic Bitholding Screwdriver is one of thousands of quality tooling products available from MRO Tools. Please browse Wera ESD Series Tools for tools similar to the 05051464001 Wera Kraftform 816 R ESD Non-Magnetic Bitholding Screwdriver. 05051464001 Wera Kraftform 816 R ESD Non-Magnetic Bitholding Screwdriver description summary: Wera Kraftform 816 R ESD Non-Magnetic Bitholding Screwdriver. Point Size: 1/4'' Handle Overall Length: 119mm Quantity discounts may be available for the 05051464001 Wera Kraftform 816 R ESD Non-Magnetic Bitholding Screwdriver. Please contact MRO Tools for details.